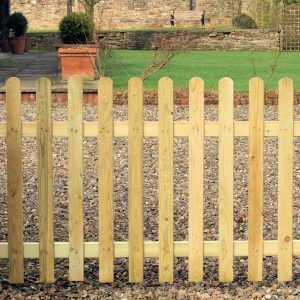 Palisade fencing which is similar to picket fencing creates a charming look when used to partition your garden. The panels used mark the ideal boundaries while keeping your pets or kids from straying into unwanted areas. The palisade fence panels from Sheds to Last are made from durable, pressure treated timber. They have different topping designs and the perfectly planed wood gives them an exquisite finish. 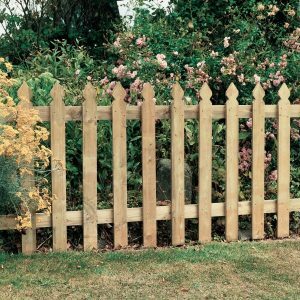 Palisade Fence Panels come with a long term guarantee. The dip treatment makes them solid against rot and decay. 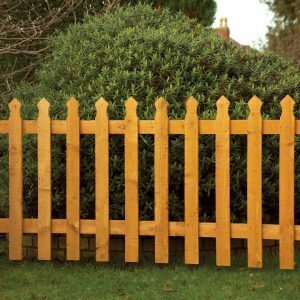 We provide different wood length for these panels meaning that you can choose pieces that match the fence length you desire. You can choose low level or high level palisade fences as long as they fit your needs. Our experts will help you choose a product and they can come pre-made and ready for installation. Whereas the palisade fence looks like wide slats, it is durable and stable. When you pick our panels, we act quickly and deliver within the agreed timeframe. We don’t provide low quality products whatsoever. Our palisade products are made from quality raw materials and the prices are affordable. We guarantee you a classic look with the finished product while the matching palisade gates give your fenced a striking look. The natural wood finish on these panels can be customised or painted according to your wishes/tastes. 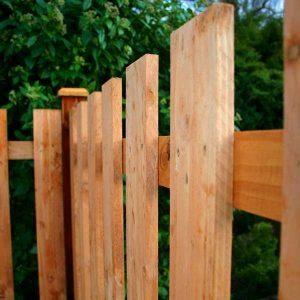 At Sheds to Last, we have built a reputation for our professional fencing services and products. Our palisade panels are suitable for any region or environment. We provide premium timber panel that offer value for money. Talk to us and trust us to provide high fidelity palisade fences according to your preferences and budget.